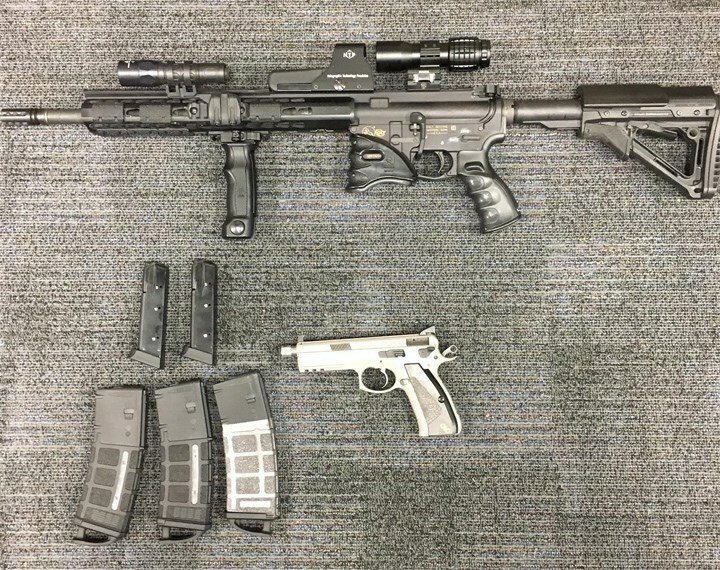 The CASE (Contra Costa County Anti-Violence Support Effort) Team last month launched an investigation into a person who was allegedly buying guns in Nevada (that were illegal in California), transporting them into California and selling them. Following the investigation, the CASE Team obtained an arrest warrant for 50-year-old Virgilio Salazar of Antioch and a search warrant for his home. Salazar was arrested on March 27, 2018. During a search of his home, the CASE Team seized a .223 Colt AR-15 as-sault rifle, CZ 9mm semi-auto assault pistol, three large capacity rifle magazines, and two large capacity pistol magazines. Salazar was booked into the Martinez Detention Facility on the following charges: importing an assault rifle, possession of an assault rifle, and importing large capacity magazines. He is being held in lieu of $300,000 bail. He has since bailed out. The CASE Team is a joint effort by the Office of the Sheriff, California Department of Justice, California Highway Patrol, Bureau of Alcohol, Tobacco, Firearms and Explosives, Pittsburg Police Department, Walnut Creek Police Department, and Probation Officers from the Contra Costa County Probation Department. CASE was created in November 2011 as a collaborative effort to reduce violent crimes in Contra Costa, especially those related to illegal firearms. This entry was posted on Friday, April 6th, 2018 at 9:16 pm and is filed under News, Police & Crime. You can follow any responses to this entry through the RSS 2.0 feed. You can leave a response, or trackback from your own site. Hey RJB. I’ve noticed that you continually insult Antioch. What safe heaven town to you live in? Hey MSB I’ve ever noticed you here before. What town do you live in? Where are the rest of the crime supports who try to post trying to dilute the seriousness of this crime??? Hey want you all to believe this is normal for ANY city to put up with criminals endangering the lives of law abiding citizens. I’m with you RJB! I’m sick of this, that we are supposed to accept this as normal! Yeah, normal like in Oakland, or Chicago, but we are supposed to be suburb, safer than those big cities, but its obvious all those criminals have come to Antioch, and the local govt has no problem with it since they get tax money out of it. Thanks Antioch!